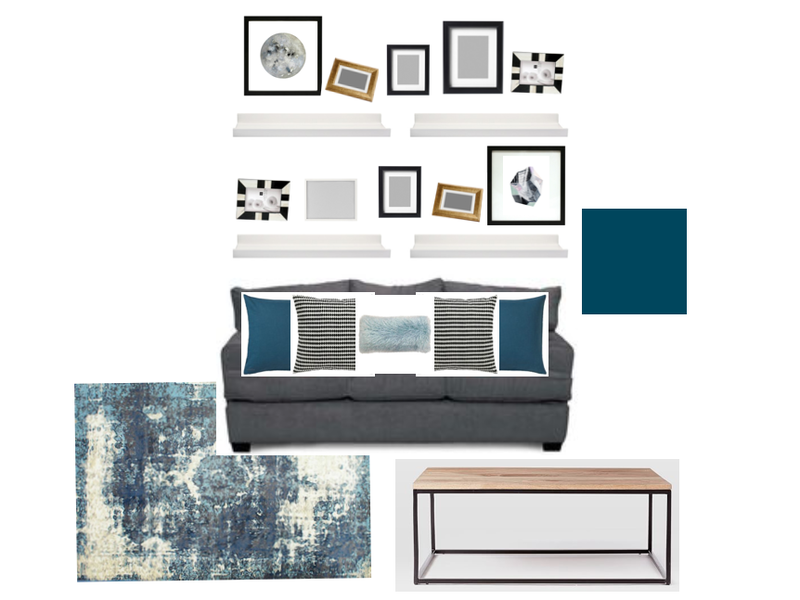 For today's Makeover Monday I am going to show you the first concept design for our Family Room. You might remember the first wall from the picture ledge post. The rooms overall colors are on the cool side. In this room I decided to include some wood to add some warmth. We have been going back and forth on whether we want to paint all of the walls in the Family Room blue. Some days we feel like it will be too drastic and other days we love it. In front of the wall we have one of our gray couches. These couches were the first big purchase Erik and I made when we got married. And we still love them! Above this couch are our picture ledges. I love how they display our photos and tie in the colors of the room. On the couch we have a few different styles of throw pillows. Any one else collect these bad boys? In front of the couch we have a blue area rug. The gray couch created enough of a break from the blue wall for me to justify the blue rug. On top of the rug we have a wood table. The black legs of the table tie it in with the rest of the room and give it a modern feel. 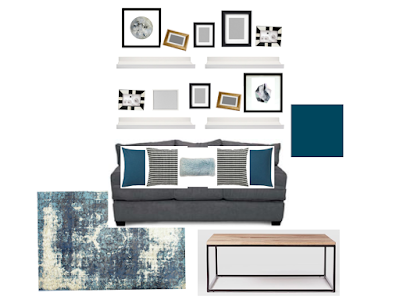 And that is our first concept design for our Family Room!